"Medicaid now covers over 62 million Americans, more than Medicare or any single private insurer. Medicaid covers more than 1 in 3 children and over 40% of births. In addition, millions of persons with disabilities rely on Medicaid, and so do millions of poor Medicare beneficiaries, for whom Medicaid provides crucial extra help. 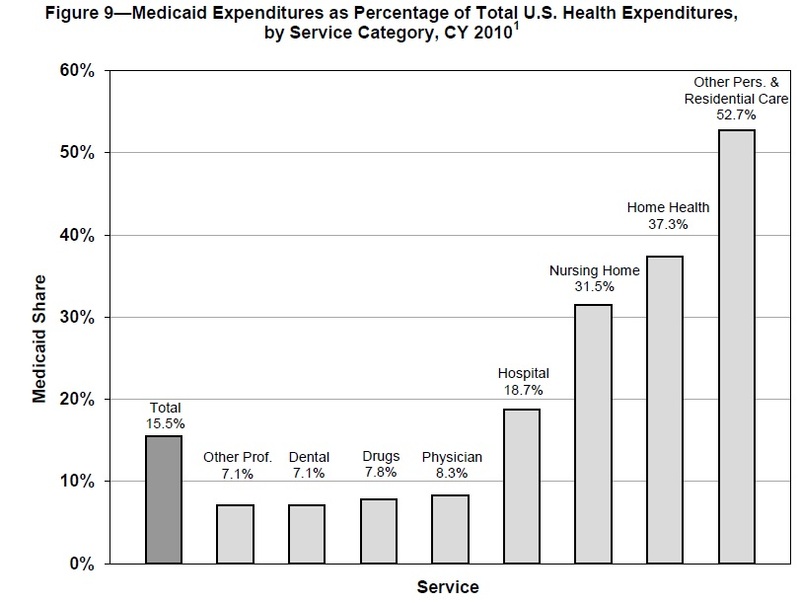 More than 60% of people living in nursing homes are covered by Medicaid." 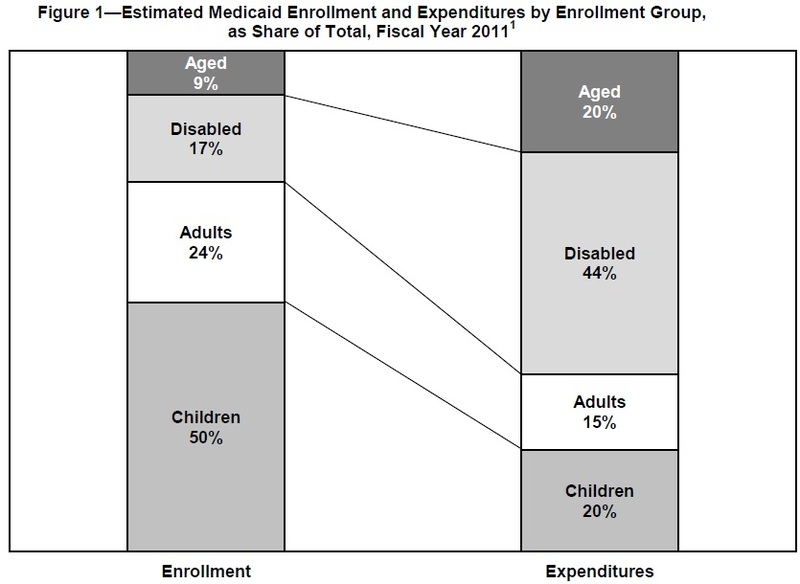 2012 Actuarial Report on the Financial Outlook for Medicaid. Although Medicaid is the primary program to provide health insurance for those with low incomes, and although most of the participants are low-income children and (in some states) their parents, it has also long been true that most of the spending in Medicaid is on the elderly and the disabled. For illustration, here is figure from the Medicaid actuaries. 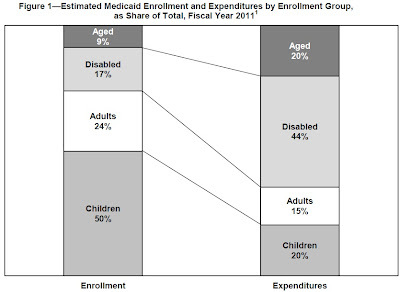 The aged and disabled are 26% of Medicaid participants, but account for 64% of Medicaid spending.The Kaiser report notes: "In 2009, per enrollee payments for children covered by Medicaid were about $2,300, compared to $2,900 per non-elderly adult, $15,840 per disabled enrollee, and $13,150 per elderly enrollee." By design, Medicaid has traditionally only been aimed at covering some of the poor. The Kaiser report explains: "The cost of Medicaid is shared by the federal government and the states. The federal government matches state Medicaid spending based on a formula specified in the Social Security Act. By statute, the federal match rate is at least 50% in every state, but the lower a state’s per capita income, the higher the federal match rate it receives. ...The federal core groups that states must cover to receive federal Medicaid matching funds are pregnant women, children, parents, elderly individuals, and individuals with disabilities, with income below specified minimum thresholds, such as 100% or 133% of the federal poverty level (FPL). One group that historically has been excluded from the core groups is non‐elderly adults without dependent children (“childless adults”). ... [R]eflecting their more constrained eligibility, at any given point during the year, only about 40% of poor parents and just a quarter of poor childless adults are covered by the program, and poor adults are more than two-and-a-half times as likely as poor children to be uninsured." 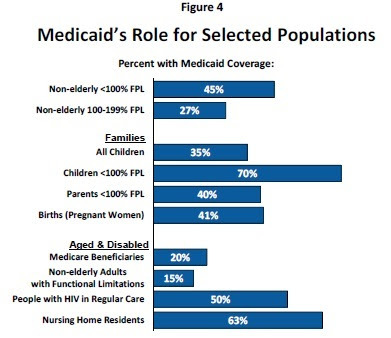 Here's a figure from the Kaiser report showing what percentage of different populations is covered by Medicaid (but remember, this will vary across states). Even among children below the poverty line, 70% are covered by Medicaid; for their parents, it's 40%. Among the elderly, 63% of nursing home residents are on Medicaid. As another way of looking at the design of the Medicaid program, consider what services it covers. 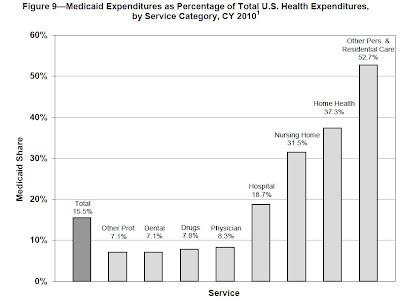 Medicaid is 15.5% of total U.S. health care spending, and roughly the same percentage of total U.S. hospital costs. However, it is a much lower percentage of doctor visits, and a much higher percentage of total national spending on nursing home care, home health care, and other residential care. The Affordable Care Act seeks to use Medicaid as a tool for expanding the number of low-income Americans with health insurance. The Kaiser report explains: "The ACA expands Medicaid by establishing a new Medicaid eligibility group for adults under age 65 with income at or below 138% FPL [federal poverty line].These adults make up about half the uninsured. 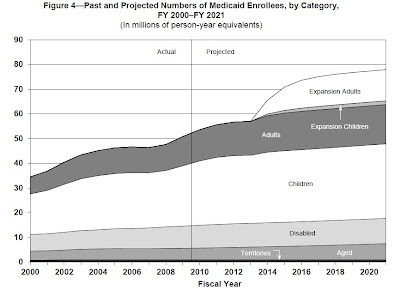 Accounting for enrollment among adults who gain Medicaid eligibility due to the expansion, as well as increases in participation among children and adults eligible for Medicaid prior to the ACA, Medicaid enrollment is expected to increase by 21.3 million by 2022. (Note: The ACA does not change Medicaid eligibility for the elderly and people with disabilities.) The Medicaid expansion is effectively a state option. Although the ACA required states to expand Medicaid, in its June 28, 2012 ruling on the constitutionality of the ACA, the Supreme Court curtailed HHS’ ability to enforce the requirement. Specifically, the Justices ruled that HHS cannot withhold federal matching funds for the “traditional” Medicaid program if a state does not implement the Medicaid expansion. The Court’s decision effectively converted the Medicaid expansion to a state option. States that do expand Medicaid must expand it to the 138% FPL threshold to receive the enhanced federal match." While the Affordable Care Act can encourage states to expand Medicaid coverage, it's not yet clear how many states will do so. Such attempts will also face some long-standing problems. One issue is that many of those currently eligible for Medicaid don't participate, and it's not clear how many people will come into the program as a result of expanding eligibility further. The Kaiser report states: "About 85% of children who are eligible for Medicaid or CHIP participate. However, participation rates among adults are lower – 63% for adults overall and only 38% among childless adults. More than 70% of uninsured children are potentially eligible for Medicaid or CHIP but not enrolled." There's also a problem of whether physicians will accept Medicaid patients, and the expansion in the number of Medicaid patients, for treatment. Here, the Affordable Care Act requires states to raise the pay of Medicaid up to the level of Medicare--a whopping increase in many cases. The KFF report explains: "A recent report of the General Accountability Office shows that 83% of primary care physicians (PCP) and 71% of specialists serving children participate in Medicaid and CHIP. However, among PCPs who participate, only 45% accept all new Medicaid and CHIP patients (children), compared to 77% who accept all new privately insured children. Among participating specialty care physicians, about half accept all new children covered by Medicaid and CHIP, while almost 85% accept all new privately insured children. ... In 2012, Medicaid fees for primary care services averaged 59% of Medicare fees for the same services, and the Medicaid‐to‐Medicare fee ratio for services overall was 66%.53 The ACA requires states to pay primary care physicians at least Medicare rates for many primary care services in 2013 and 2014, in both fee‐for‐service and managed care. The magnitude of the primary care fee increase for the affected services – 73% on average – is unprecedented in Medicaid." "From program inception, the cost of Medicaid has generally increased at a significantly faster pace than the U.S. economy. In 1970, combined Federal and State expenditures for Medicaid represented 0.5 percent of gross domestic product (GDP), but this percentage grew to 0.9 percent in 1980, 1.2 percent in 1990, 2.1 percent in 2000, and 2.8 percent in 2011. 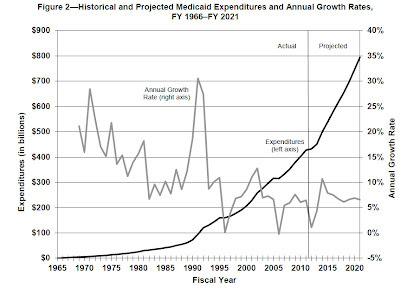 As illustrated by the actuarial projections in this report, Medicaid costs will almost certainly continue to increase as a share of GDP in the future under current law. Although much of Medicaid’s expenditure growth (both past and future) is due to expansions of eligibility criteria, the per enrollee costs for Medicaid have also usually increased significantly faster than per capita GDP. 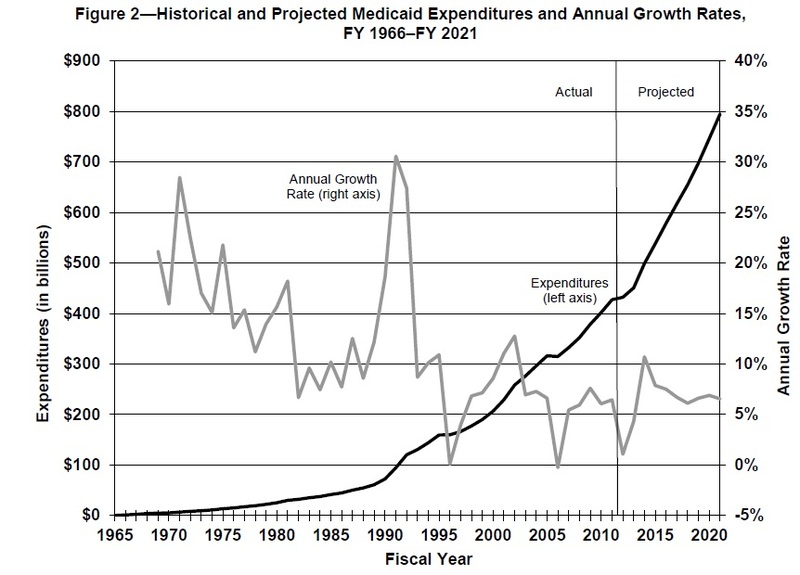 This growth pattern is not unique to Medicaid. Costs for virtually every form of health insurance, public and private, have increased rapidly .... Over the next 10 years, expenditures are projected to increase at an average annual rate of 6.4 percent and to reach $795.0 billion by 2021." 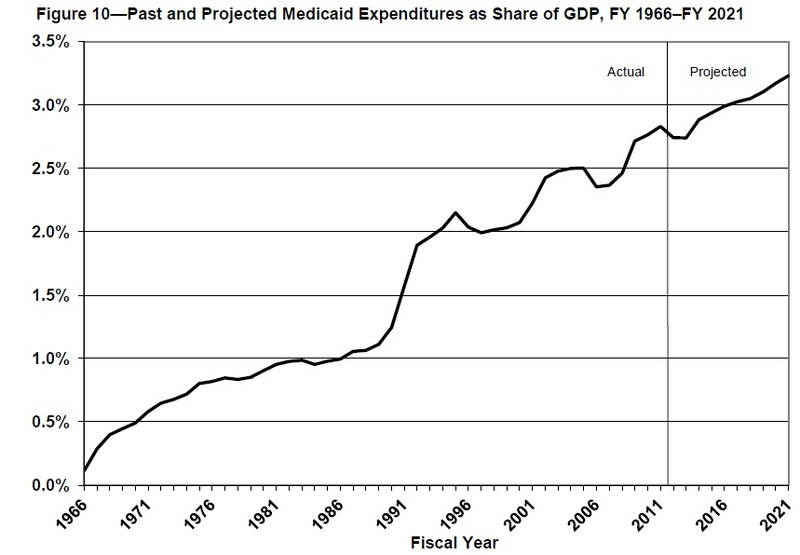 Here's a figure that shows Medicaid spending in nominal dollars over time, with annual growth rates of that spending. 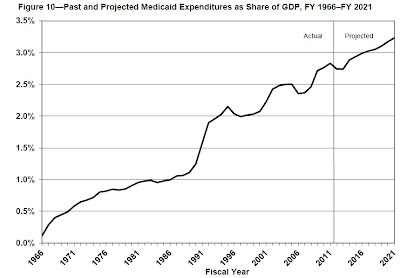 Here's a figure that shows rising Medicaid expenditures as a share of GDP. 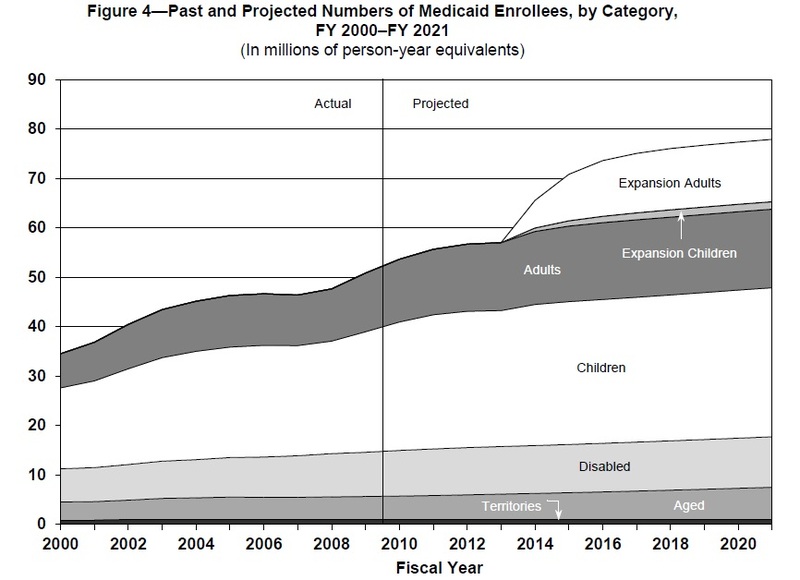 Here's the figure showing the estimates from the actuaries of how Medicaid enrollment has expanded over time--and the added expansion that is expected to happen as part of the Affordable Care Act. The actuaries write: "The Affordable Care Act is projected to increase Medicaid expenditures by a total of $514 billion for 2012 through 2021, an increase of about 9 percent over projections of Medicaid spending without the impact of the legislation. Most of this increase is projected to be paid by the Federal government ($468 billion, or about 91 percent), which would be about 15 percent greater than projected Federal expenditures excluding the impact of the Act." About a year ago (February 10, 2012), I posted on some of these same issues in "Medicaid in Transition."